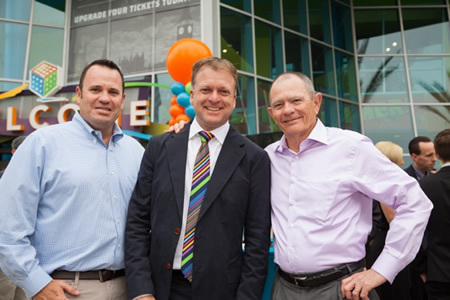 Locals Steve and Jim Muzzy flank Joe Adams at the grand re-opening of the expanded Discovery Cube earlier this month. Laguna Beach residents Steve and Jim Muzzy and Dan Bolar helped raise $17 million to remodel Discovery Cube in Santa Ana with new exhibits. Kids can now design and build a space rover or satellite, take virtual helicopter tours or go on a digital scavenger hunt. The expansion represents Discovery Cube’s commitment to stay current with science, technology, engineering and math trends and create an entertaining approach to education, president Joe Adams said in a statement. Pacific Blue Yoga, 610 N. Coast Highway, celebrates its grand opening Saturday, June 27, with free yoga classes all day and a 6:30 p.m. party with food, drink, raffle items, swag bags and grand prize drawings. The schedule will include kids yoga, Bikram and non-heated classes from 8 a.m. until 4:30 p.m.
Now, Perkins hosts a blood drive at 2:15 p.m. on Sunday, July 5, at Pacific Ashtanga Yoga Shala, 34207 Pacific Coast Highway, in Dana Point as part of their 10th anniversary celebration. “What better way to celebrate our health and our community than to give the gift of blood, health and possibly help save a life,” says Diana Christinson, co-owner of the studio. Blood donors will receive gifts ranging from a free yoga class to Perkins’ book plus homemade cookies provided by yoga students. Perkins also founded Moving Hearts Foundation, of Irvine, which promotes organ and blood donations. The Community Datebook announcement, “Make Time to Save A Life, in the June 26 edition incorrectly listed the hours to donate blood. Donations can be made from 8 a.m. until 2:15 p.m. Sunday, July 5, at Pacific Ashtanga Yoga Shala, 34207 Pacific Coast Highway, in Dana Point. 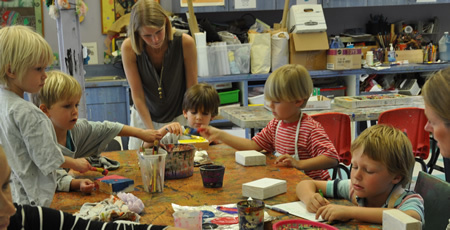 The studio is owned solely by Diana Christinson. She was incorrectly listed a co-owner. Caleb and Jacob Cornell, Grayson Grzeskowiak, Jake Brown and Max Osborne create Father’s Day gifts at a Parents Club craft day led by Jennifer Grzeskowiak. Laguna Beach Parents Club marks its 10th year with a 5 p.m. party Friday, June 26, at Bluebird Park, 798 Bluebird Canyon Dr.
Non-members are welcome to bring a picnic, meet members and learn more about the club, which will provide cupcakes, balloons, bubbles and special soccer sessions. With 150 member families, the club meets for playgroups, excursions, family get-togethers, parent nights and speakers. Co-Presidents Jennifer Leonti and Lisa Robertson-Beery aim to give parents a way to stay connected beyond the preschool years with website and technology updates and new community partnerships. For more info: visit lagunabeachparents.com. Daily trolley service resumes Friday, June 26, with hours from 9:30 a.m.-11:30 p.m.
Up to 25 trolleys will hit the streets on busy weekends along three routes, transit officials said in a statement. The Coastal Route will now extend to El Morro Elementary School with stops at Emerald Bay and Irvine Cove, which allows passengers to travel from north Laguna to the Ritz Carlton in Dana Point without transferring. The Canyon Route has been extended to the downtown, with inland boarding stops at Laguna, Legion and Cleo streets. The previous Canyon Route, between the bus depot and the ACT V parking lot, remains unchanged. The Laguna Beach Beautification Council bestowed awards on residential and commercial properties with exceptional “curbside appeal” earlier this month. In the commercial category, Laguna Riviera Beach Resort and the Cliff Restaurant were recognized. Ruby Street Park and the Main Beach mural sculpture “Grace,” by the late Terry Thornsley, were winners in the city category. In addition, 14 private residences were chosen. Established in 1953 by Harry Lawrence, the council spotlights natural beauty and cleanliness, while the current leader, Ruben Flores, also promotes beautification projects. The public is welcome to join the council’s potluck picnic at 5 p.m. Thursday, July 9, at Alta Laguna Park, 3300 Alta Laguna Blvd. Applications to serve on the city’s Housing and Human Services Committee are now being accepted by the City Council. The committee consists of seven members who serve two-year terms. The terms of two members expire on June 30 and the two applicants who are accepted to serve will begin their terms immediately. The committee advises the council on affordable housing and services for seniors and the disabled. Applications are due to the city clerk by Tuesday, July 7 at 5 p.m.
Nine hikes and activities will be available this July at the Laguna Coast Wilderness Park. Laguna Canyon Foundation volunteer naturalists and Orange Country Parks staff will lead hikes and teach about the flora, fauna, geology and history of the 20,000-acre wilderness area. All ages are welcome, but participants under the age of 18 must be accompanied by an adult. Online reservations are required. For the schedule or to make a reservation, visit www.lagunacanyon.org/activities.html. Local philanthropic organizations can apply for grants from the Rotary Club of Laguna Beach. Grants awarded range from $1,000 to $3,000 and the deadline for submission is July 10. Recipients will be announced in August. For info: contact Cecily Ginger at [email protected]. Pingback: Best Online Cord Blood Elution Santa Ana | How much does cord blood banking cost?